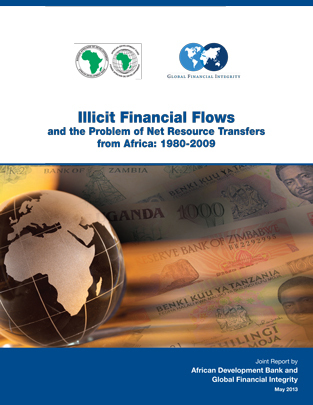 This May 2013 report jointly produced by Global Financial Integrity and the African Development Bank finds that, from 1980 to 2009, developing African countries lost up to $1.4 trillion in net resource transfers, which are comprised of both licit and illicit flows, including investment, remittances, debt relief, and illicit financial flows. The implications of this report are broad. Despite foreign aid, natural resource exports, and other transfers, developed countries still take away more resources than they give to Africa. Between 1980 and 2009, the economies of Africa lost between US$597 billion and US$1.4 trillion in net resource transfers away from the continent. These transfers include both licit flows, such as investment, foreign aid, debt relief, and remittances moving into and out of the country, and illicit flows, such as the proceeds of crime, corruption, and tax evasion moving out of the continent. The resource drain on Africa over the past thirty years is almost equivalent to Africa’s current GDP. This represents a major drag on African development, and dwarfs much of the effort that donor countries undertake to boost the continent’s struggling economies. Require banks and tax havens to regularly report to the Bank of the International Settlements (BIS) detailed deposits by sector, maturity, and country of residence of deposit holders. Address the problem of shell companies by requiring that all corporations, foundations, and trusts confirm beneficial ownership information in all banking and securities accounts. Address capacity issues and corruption domestically within African tax authorities. Pursue automatic cross-border exchange of tax information on personal and business accounts, ideally on a multilateral basis.